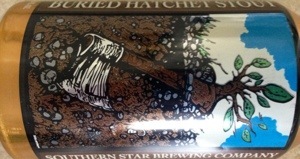 Buried Hatchet pours dark brown with a frothy mocha head. The smell hits hard with roasted coffee grounds. There’s a great milky sweetness in there, with lots of milk chocolate and hints of dark chocolate and vanilla. A light hop presence is noticeable, but the roasted scents really dominate. I’ve gotta say, I’m in love with the nose, especially as it warms. So creamy and full of roasted chocolate notes. It’s not big and bold as is typical of the style, but soothing and still full of life. The taste is full of roasted notes. Chocolate, both dark and milk, and coffee dominate. It definitely has a light sweetness to it, caramel or milk. The bitterness is minimal, although it’s there for a second near the back of the throat and along the tongue. Everything here makes me think milk stout. The mouthfeel is creamy and coats the mouth, but not quite heavy. On the high side of medium body, but still pretty light. Decent carbonation, dry finish. Overall: 4.5/5. Buried Hatchet may not measure up to some of the big and beastly imperial stouts out there, but it’s damn good. Ridiculously easy drinking, yet still full of flavor.